CasinoBonusNews → Casinos → "Begado Casino review"
A whole new world and a new gaming experience awaits with NuWorks-run casinos like the just-launched Begado Online Casino. While some infant casinos and gaming software may take a while to get their footing, Begado’s choice of running NuWorks software means it is up and running quickly. This new gaming platform is a sister software package to Real Time Gaming. 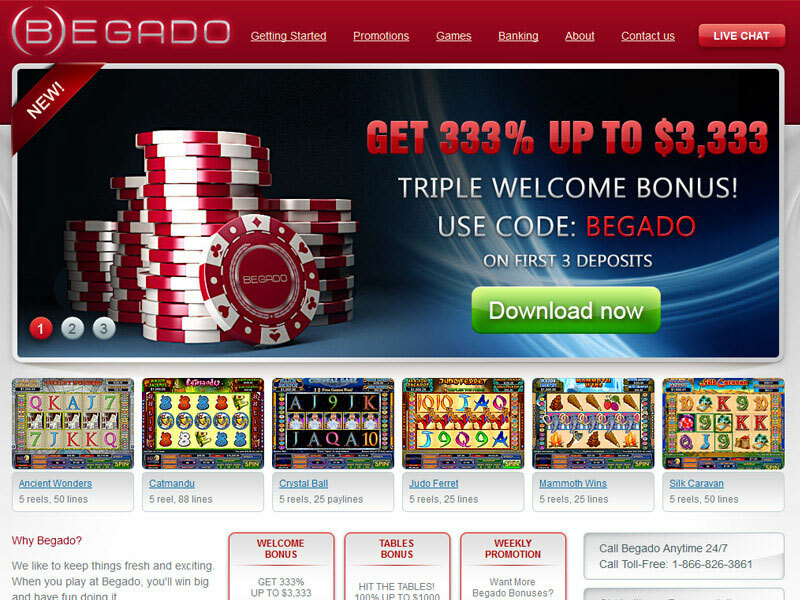 Begado Casino is, therefore, just a few chips away from being a full-fledged online casino to be reckoned with. What makes Begado and its companions unique is the new collection of slot machines available. Currently, 26 slot machines are ready and willing to be spun for riches, most with three separate progressive jackpots. These include the elegant Sword Of The Samurai and the Napoleonic-themed Iron Duke, which gives players the illusion of either playing as a Japanese warrior or the famous French general. Begado Casino also offers three types of video poker or one of three casino-level table games: Tri-Card Poker, baccarat or blackjack. This may seem like a small number of games compared to longer-established online casinos, but the fact that Begado is just starting out means it has a strong reason to compete for business by pulling out the big guns, or in this case, the big bonuses. The casino reels in customers with its $9,999 Bonus, which is a welcome bonus that promises players 333 percent in bonus funds, up to $3,333 in bonus chips, added to their account on their first three deposits. This free money can only be used at the slot machines, though. Alternately, table game lovers can cash in on a bonus which gives a 100 percent matching bonus on a deposit up to $1,000 which can be wagered on video poker, blackjack, Tri-Card Poker or slot machines. Begado then gives its reoccurring fans a choice from three unique daily bonuses. Players can opt to get a 100 percent matching bonus on their second deposit of the day up to $500, they can choose the “after dark” bonus that promises 10 to 20 percent in bonuses on top of the regularly received bonus, or they can decided to take a chance on the special of the day which could be anything from free spins to table bonuses. These are on top of Begado’s weekly bonuses that can be redeemed for bonus funds to be used on either slots or table games. When it comes to funding the bankroll, Begado uses U.S. dollars for its currency of choice, which is one big indicator that U.S. players are encouraged to sign up. Deposits can be made through Visa, MasterCard, UnionPay, NETeller or MoneyBookers. After verifying the account holder’s information and identity, Begado gives players quick and easy withdrawal methods to take out their winnings. The casino uses wire transfers, NETeller and MoneyBookers for withdrawals. The Begado Casino Web site is full of useful information for those with questions about banking, software issues or gameplay, but for those who need and extra helping hand technical support with a live human being is only a few clicks away. The site supports a live chat room that is available 24 hours a day, seven days a week. Telephone representatives are also on hand through a toll-free help line, or players with less pressing issues may decided to contact support through the casino’s Email address which, while quick, may take a bit longer to receive a response than the other two methods. 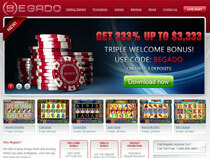 Veteran gamblers and first-timers alike can find a lot to keep them occupied at the online Begado Casino. In a business where long-standing service is revered, sometimes it pays to take a chance on a brand new place. Begado Casino seems to have the staying power to keep customers coming back year after year.